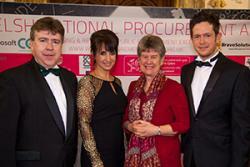 The Welsh National Procurement Awards 2015 took place at City Hall on March 20, 2015. The Awards celebrate achievements in Wales, in Public Procurement, Public Service Delivery and Tendering and are organised by Bangor University’s Institute for Competition & Procurement Studies with the support of the Welsh Government. The Awards ceremony is the opportunity for all those who buy for, and supply, the Welsh public sector to show what best practice really is so we can celebrate achievements and thank those who have made a contribution to the well being of Wales. Left-right at the Procurement Awards were: Prof Dermot Cahill, Lucy Owen, the evening's presenter; Welsh Government Minister, Jane Hutt and Gary Clifford of the Institute of Competition & Procurement Studies.Congratulating the winners, Finance Minister, Jane Hutt said: “The Welsh National Procurement Awards are a fantastic opportunity to celebrate the great work taking place within public sector procurement across Wales. These are real success stories and by sharing best practice we can continue to build on this”. The Minister presented the Awards on the night alongside Frank Brunetta, Procurement Ombudsman of Canada, Mark Roscrow of the NHS plus many more national and international judges. The Awards marked the end of Procurement Week, a five day international procurement conference, organised by Bangor University and supported by the Welsh Government. Welsh Government support helps the Awards and indeed Procurement Week, to attract a huge range of national and international experts to meet and discuss the latest innovations in public procurement practice and modernisation. Procurement Week is now one of the largest and most extensive procurement conferences in the UK, which, this past week alone brought 852 delegates to Cardiff for the Week. It covered topics as diverse as Smart Cities procurement initiatives, examining how major cities such as San Francisco, Singapore and Amsterdam are modernising their urban environments by procuring new technologies to improve the life of the city citizen. Procurement Week's audience also assembled leading QC's and EU Law experts to review recent developments in European procurement law and consequent flexibilities that can be used by the public sector to procure more innovatively. The Awards were compered by Lucy Owen BBC, and the panel of national and international Judges was chaired by Professor Dermot Cahill, Head of Bangor University Law School who also heads up the Institute for Competition & Procurement Studies. Addressing the Awards Ceremony, Professor Cahill congratulated the nominees and winners and observed that Welsh procurement was currently raising its profile in an environment where organisations were increasingly realising the benefits of procurement modernisation, and that while there is always more to be done, there was substantial evidence that things were moving in the right direction to improve the procurement landscape. The Adoption of E-Procurement Award was won by Pembrokeshire Co Council’s team led by Paul Ashley Jones, with the Judging Panel observing that “This nomination is of exceptional importance because it reinforces the feasibility of eProcurement, even in small geographical spaces, which normally have numerically limited teams. It is a great inspiration for deepening and expanding the use of such tools”. The Supplier of the Year Award went to New Directions Education, a recruitment and training provider to the education sector in Wales, which supports teachers and schools with their supply needs. In 2012, the organisation was awarded preferred supplier status for the provision of staff to the education sector throughout Wales. The Award for Most Improved Supplier in Tendering was accepted by Donald Woosnam, Director of Woosnam Dairies, a local family owned dairy company based in Caerphilly. Established in 1978, the company has gone from strength to strength to become one of the area’s most popular independent retail dairies. Clear information and detailed evidence provided demonstrated the measurable and significant benefits in terms of improved outcomes, value for money, and savings, as well as some really good examples of best practice that other organisations could learn from, were the reasons why the Award for Most Progressive Procurement Organisation went to a team led by Mark Roscrow from NHS Wales Shared Services Partnership. The 2015 Award for Procurement Collaboration went to Dan John Pembrokeshire County Council.